Dedza, Malawi (AFP) – The dream of a new life in South Africa has turned into a nightmare for hundreds of Ethiopian migrants held in overcrowded Malawian jails despite having served their sentences for illegal entry. “This prison is hell on earth. We are in prison despite paying the fine,” a tearful 15-year-old Eyasu Tadiya told AFP inside Dedza prison, 85 kilometres (50 miles) south of Lilongwe, the administrative capital. Eyasu, looking weak and thin, said he had been on his way to join his father in South Africa, but had now given up hope of making it to the continent’s most developed economy. “The journey has ended here and I just want to go back home rather than suffer in this way,” he said. Prisons spokesman Evance Phiri told AFP the inmates were held even after they had paid their fines or finished their sentences because of a lack of funds to send them home. While recent concern over migrants has focused on Europe, Malawi says there has been a sharp rise in Ethiopians, Somalis and other Africans using the impoverished country as a transit route to seek work in South Africa. Eyasu was in a group of 29 Ethiopians arrested in July as they tried to make their way south. He says he and five others paid $62 fines for illegal entry, but remain in prison. The others were sentenced to six months in jail. A senior prison official, who did not want to be named, said the facility holds 380 inmates although it was designed to house just 100. “We face a lot of challenges, mostly lack of food,” the official said. 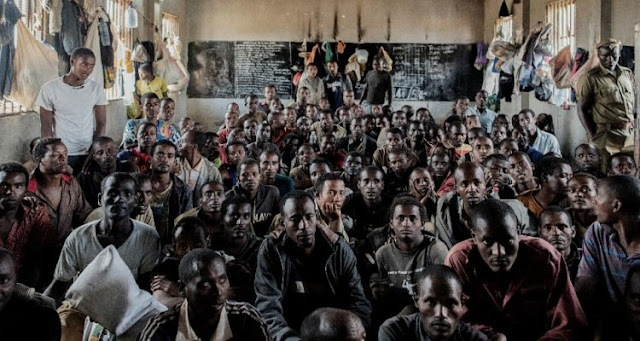 According to the medical charity Medecins Sans Frontieres (MSF), 317 Ethiopians are in the same plight, with most of them held in Lilongwe’s Maula prison, which is designed to house 800 inmates but holds 2,650. MSF is part of an international effort to help the imprisoned migrants, many of whom have served their six-month sentences but remain in jail months later. “We are tired of being in prison here where life is tough,” Ethiopian Abebe Aleme told MSF in an interview last week in Maula prison, adding that many prisoners were ill with tuberculosis, malaria and skin ailments. Aleme, 41, said he wanted to go to South Africa “because in our country we don’t have enough to live”. MSF’s head of mission in Malawi, Amaury Gregoire, said “the large majority of those people are only guilty of dreaming of a better life in South Africa. MSF says health conditions at Malau are “critical”, with one tap for 900 prisoners and one latrine for 120 inmates. Malawian high court judge Ken Manda admitted that “most of those arrested (for illegal entry in Malawi) were judged, sentenced and fined, but they are still in prison, waiting to be repatriated”. “Migrants detained face a host of health and human rights issues,” he said last month. About 70 prisoners were repatriated to Ethiopia in late September with help from the US Bureau for Population, Refugees and Migration. The International Organization for Migration (IOM) is now trying to organize flights home for the others. The IOM told AFP that nearly $200,000 would be needed to repatriate all 317 Ethiopian prisoners. Their daily lives improved slightly recently thanks to the generosity of a local NGO, “Concerned Citizens”, that offers them food, clothes, soap and translation services.